I made my first Easter bonnet for my children last year. I bought a cheap hat and stuck little chickens and eggs all over it. The result was pretty good, but I felt like I’d cheated. This year I have made the whole thing, with a little bit of help from my girls. 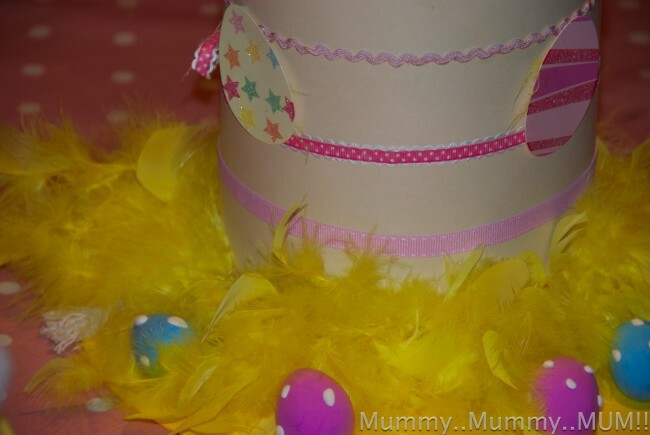 Feathers, eggs, stickers or anything you want to decorate the hat. Using one piece of cardboard, wrap it around the head which is to wear the hat and mark how big it needs to be. 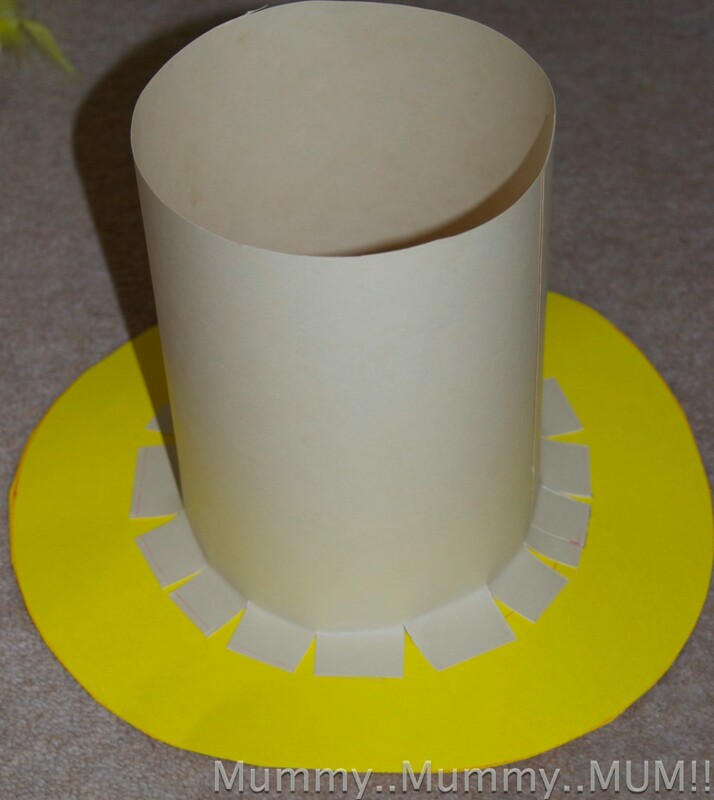 Secure the card with the double sided tape so it forms a cylinder, this will be the main part of the hat. At one end cut slits all the way around about 1.5cm high. Bend the cardboard between the slits out so it lies flat and attach pieces of tape to the underneath. Using the second piece of cardboard, cut out a large circle about 3 inches bigger than the circle in step one. Stick the main hat part to the centre of the circle, and cut out the inside, so you are left with a hat with a brim. I used a feather boa to hide the messy part at the bottom, tied some ribbons around the main part of the hat, and stuck on some eggs cut from last years Easter cards. The eggs are made from special air drying dough from Yellow Moon. It is very easy to use and very effective. Seems you had a lot of creative fun making this…and your young one is delighted to be wearing it! 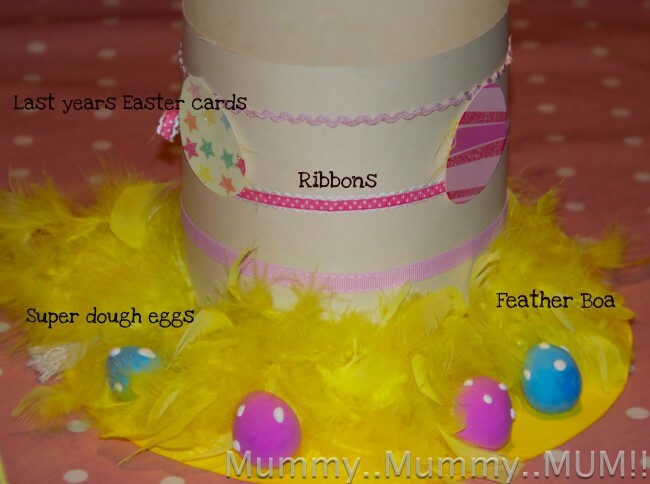 What a great hat – I’m yet to make an easter bonet for mine… this year I will try and I love the idea of using a feather boa. Very stylish! I can see her at Ascot Ladies day ! Love the jaunty angle! Oh bless it looks fab! 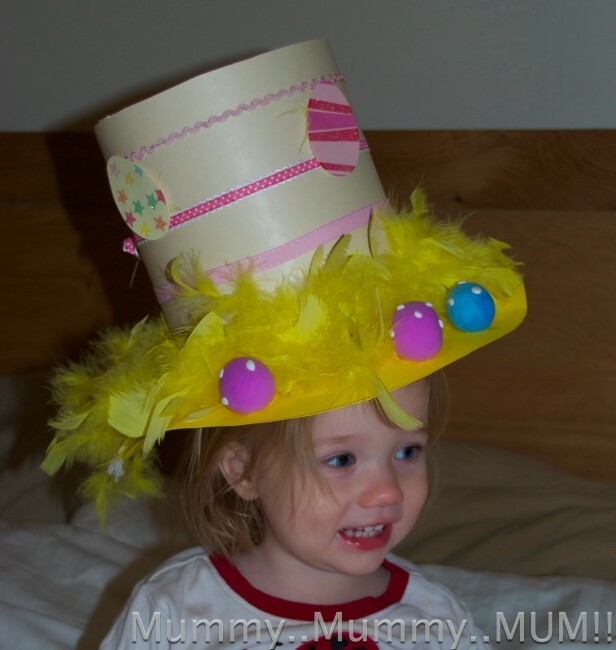 Loving the yellow feather rim – I need a hat with one of those! How fun!! I guess I really cheated last year since I bought an Easter bonnet and just hot glued fake flowers on to it. Love yours though! Thank you for sharing at Sharing Saturday!! I hope you are having a wonderful week!